Sound Healing or Sound Therapy may seem like the latest New Age trend, but in fact it dates back thousands of years. Our ancestors embraced sound as the very essence of life itself. The ancients understood what modern science is now beginning to discover; that we live in a sea of vibration—the source of all form, the source of all thought. Many cultures and religions revere sound so deeply as to believe it called the universe into being. Among the legacy of mathematics, Pythagoras, often considered the Godfather of Modern Sound Medicine, taught his students to use sound and music to soothe the spirit, release worry, fear and anger and enhance joy and happiness. He explained how sound functions in relation to the universe, “…each and every atom produces a particular sound on account of its movement, its rhythm or vibration. All these sounds and vibrations form a universal harmony in which each element, while having its own function and character, contribute to the whole.” Our own body is a microcosm of that celestial symphony. Ancient cultures looked upon disease as a musical issue, therefore music and sound was the natural treatment, restoring harmony to the body, mind and spirit. — Jeffrey Thompson, D.C., director for the Center for Neuroacoustic Research at the California Institute for Human Science. Dr. Herbert Benson, M.D., of the Mind/Body Medical Institute at Boston’s Deaconess Medical Center, having studied the effects of chanting mantras on human physiology, found that repeating a single syllable or word produced measurable changes in energy consumption, respiration rate, heartbeat, metabolic rate and pulse, as well as an increase in alpha brain waves. Alchemy crystal singing bowls are both medical device and instrument. The high-grade quartz crystals in every bowl are able to amplify store, focus, transfer and most importantly transmute energy. 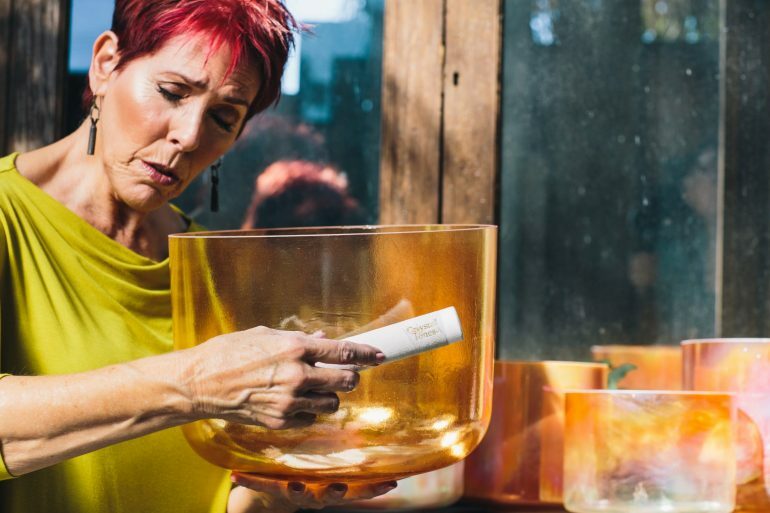 These gemstone, metal and mineral-infused crystal singing bowls have a profound impact on our bodies, as they are crystalline in structure and shares an affinity with our human DNA. The deep impact of these high frequency instruments transform not only the bones and tissues but penetrate the sub-atomic structure of the cell. According to Oncologist Mitchell Gaynor, M.D., crystal sound energy therapy is the future of modern medicine. It offers the same benefits to conditions of the body as some prescription drugs. Vibrations from crystal sound resonate the nervous system, transforms brain states and effectively treat stress, depression, sleep disorders, Alzheimer and cancer.